Brian Wilson's Clearwater show was Fun, Fun, Fun! Good Vibrations: BRIAN WILSON AND COMPANY take Clearwater's Ruth Eckerd Hall by storm! 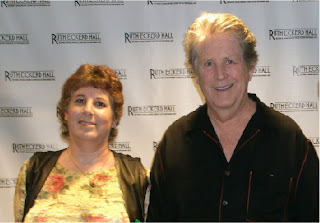 On Saturday, August 6, 2011, former Beach Boy and indisputable musical genius Brian Wilson and his band put on an electric, energetic, and fantastic 2½ hour (+) concert at Ruth Eckerd Hall in Clearwater, Florida. One of the best shows I have ever had the privilege of attending, it was pure magic from start to finish. The legendary singer/songwriter/producer epitomizes the sentiment "A man who needs no introduction," and no introduction was given. Wilson and company quietly took their places onstage in the darkness, and when the lights came up to reveal Brian Wilson, seated front-and-center at his keyboard, the ovation was roaring loud and went on for such a long time that I was surprised there was time left over for the show itself. The audience response was an indicator of how beloved this man and his music are, and an accurate predictor of the success of the concert that followed. Wilson's first number was "California Girls," a very fitting start considering that his group, The Beach Boys, became synonymous with The Golden State during the 1960s, enjoying hit after hit and helping to popularize the surf sounds of the era. A former child prodigy, Brian formed the genesis for the band in 1961 (this year marks their 50th anniversary). 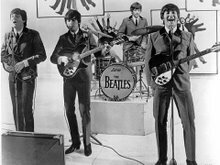 The group was signed to Capitol Records the following year. Before the decade was over, The Beach Boys had racked up twenty-seven Top Forty hits, three of which went to #1 nationally. * As its founder and main songwriter, Brian Wilson was the soul of the group, his influence still felt long after he ceased appearing with The Beach Boys and, later, started his solo career. After singing a few more hits - "Dance Dance Dance," "Catch a Wave," and "Wendy" - Wilson playfully led the audience in a singalong to "Row, Row, Row Your Boat." After a couple of lighthearted rounds of the tune, the formal set list continued on with ace guitarist and musical director Jeffrey Foskett starting off a duet with Wilson on "Then I Kissed Her." A few songs after this, Foskett took the lead on "Don't Worry Baby. "** A star in his own right, as is the case with many of the members of Brian Wilson's Band, the hugely talented Foskett has worked alongside Brian Wilson for many years; his wonderful tenor is a perfect complement to Wilson's. Several songs later, it was time for another key band member, Darian Sahanaja, to take over the lead vocal on "Darlin'" - which he delivered brilliantly in a pleasing, crystalline tenor. Two numbers ("Do It Again" and "I Get Around") later, there was a twenty-minute intermission, followed by set #2. 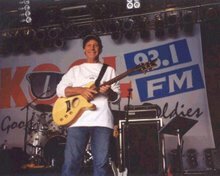 Bennett would demonstrate his own great vocal chops on "Sail On Sailor" a couple of songs later, after which the band performed the instrumental "Pet Sounds." "Sloop John B" immediately followed, then Foskett took another lead vocal turn on "Wouldn't It Be Nice." Unsurprisingly, Wilson finished the set with the song that is arguably his best known and that with which he is most identified - "Good Vibrations." Wilson and the entire band acknowledged the thunderous applause and standing ovation from the audience before leaving the stage, only to come back a few minutes later, one at a time, as Foskett introduced the band members, Sahanaja introduced Foskett, and Wilson returned for a five-song encore that would include "Johnny B. Goode," "Barbara Ann," and "Surfin' USA." The show concluded with a second encore, "All Summer Long." Counting the encores (as they must be), Brian Wilson and his band performed more than thirty Beach Boys classics, and roughly forty songs all told. During the entire concert, from start to finish, the energy in the 2,180-seat room was incredible. Brian Wilson unquestionably demonstrated the reasons for his legendary status and critical acclaim to the Tampa Bay area that night. It is my hope that the concert will be made available on DVD. And the Brian Wilson organization may consider this my formal request - or, more accurately, my impassioned plea. **The set lists for Brian Wilson's show are available for viewing on the Tour page of his official website; therefore, I did not bother to enumerate every song in my text. I encourage readers of my blog and visitors to my site to visit the artists' websites.